Celebrating 150 years of Alice in Wonderland, Camille Johnston presents a selection of Alice inspired watercolour, ink and photography. In celebration of the 150 year anniversary of Lewis Carroll’s Alice in Wonderland comes a freshly eccentric exhibition following the misadventures of Camille Joy Johnston, a London-based illustrator and photographer. The exhibition, titled Camille in Wonderland, will showcase large-scale watercolour, ink, and gouache works that evoke a distorted fairytale format and chronicle Johnston's travels between London and the American Midwest (on view 4/17-5/28). It will be celebrated with a preview event on the 17th of April from 7-11 PM; subsequent events at the gallery will include a film screening, live music and an Alice-themed life drawing night coupled with an artist's talk. Please visit camillejoy.com or hawkhurstvault.com for details. 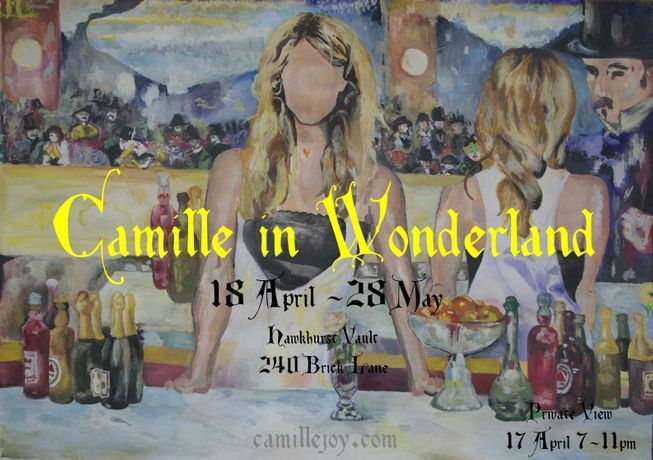 Camille in Wonderland is a show for anyone looking for the excitement and beauty of chance encounters, drawing from personal stories that convey a collective human memory that is philosophically poignant and comically kitsch. Much like Alice's adventures, Camille in Wonderland is brimming with a fascination between reality, our perceptions of reality, and what does and does not appear when one peers through the looking glass. Instead of the Mad Hatter, there’s an aging London Gangster turned property tycoon. Instead of Alice’s ‘unbirthday,’ it’s Camille’s birthday, which involves two men resembling the walrus and carpenter ranting about governmental conspiracy theories. Unbeknownst to our heroine, the ‘drink me’ potion happens to be a psychedelic substance in a water bottle that synesthetically transports Camille into Manet's The Bar at the Folies Bergere. Drawing from both popular culture as well as contemporary art and philosophy, each series provides unique insight into humanity through the lense of the adult fairytale. Camille Joy Johnston was born in Troy, Michigan. She has a BA from the University of Michigan and an MA from Sotheby's Institute. Her work has featured in various group shows across London, including Art Salon London's Artistic Solitude exhibition. This is her first solo show.